Going to quilt shows always inspires me. People come up with so many ways to do the same thing. At the Houston a International Quilt Show 2012, I saw a beautiful stained glass style wall hanging in a vendors booth. But it was odd, the ” leading had no seams and wasn’t ribbon or bias. It kinda looked like stitch and slash, but was way more refined. The pattern maker, Linda Everhart, was there with her husband selling her patterns talked w me a bit. She also sold me two patterns. The instructions in the patterns were very clear. As often happens, I got home put the patterns away and got busy with other things. I have been sick for a couple of days and going stir crazy. So I decided to do a quick project but being sick didn’t feel creative enough to start something from scratch. Also didn’t feel like manhandling some big heavy thing that needed some free motion, didn’t feel like standing at the long arm… . I pulled out those patterns I had laying around and found Linda’s Inspired Dreams. Here it is in progress. This is basically a whole cloth reverse applique. It’s really fun and fast to do. 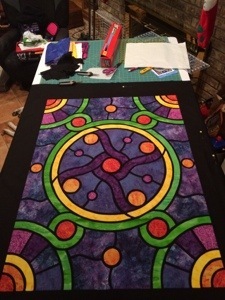 It’s a combo of fusing and applique as you quilt. You don’t do any sewing at all until you quilt the layers together. Now, for the part of assembly I think is the most fun, stripping off the last of the freezer paper. I’ll post a photo after it’s quilted. Next Next post: I have cancer, I’m not dead yet!